In conjunction with our “I Wannabe An Entrepreneur!” event happening this June holidays, Changi City Point is launching the ‘My Super Duper Invention’ Instagram Contest from 31 May to 11 June 2017 (11:59pm). There will be money surprise clip making, wallet making, balloon sculpting and bracelet making workshops happening from 5 to 11 June at Level 1 Atrium. All you have to do is to be creative and think of a name for these children’s creations that will be uploaded via Instagram and leave your answer as a comment under our Instagram post. Contest runs from 31 May to 11 June 2017 (11:59pm). The three entries with our favourite names for each product will win a $20 Changi City Point Gift Card each. Follow us on Instagram (@ChangiCityPoint_SG) and watch out for the winners’ announcement post on 21 June 2017. This Contest is open to all Singaporeans and permanent residents of Singapore, currently residing in Singapore, over 13 years of age, except employees of Frasers Centrepoint Property Management Services Pte Ltd, its advertising agencies, retail tenants of Frasers Centrepoint Malls, their immediate families or anyone else connected with this promotion. No third party entries, bulk entries or entries submitted by agents will be accepted. 1. 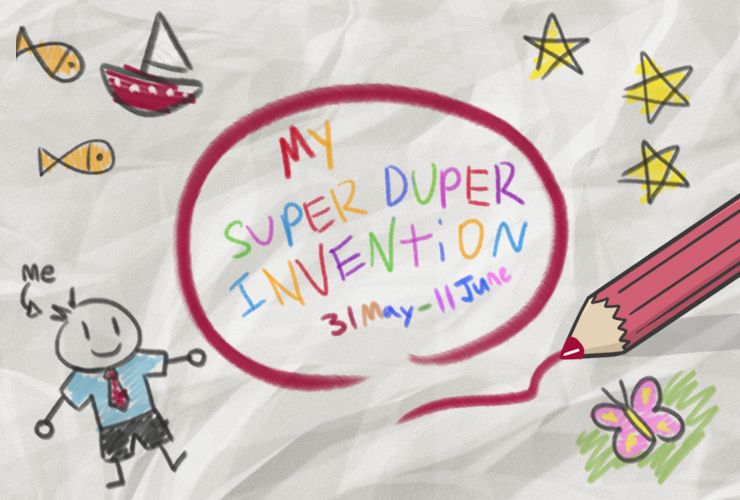 The contest is “My Super Duper Invention” and the “contest period” is from 31 May to 11 June 2017 (11:59pm). Winners will be announced on 21 June 2017. A total of three (3)winners will receive a $20 Changi City Point Gift Card each. Participants must be over 13 years of age at the start of the contest period, must have a valid Instagram account (for verification purposes) and must be a follower of the Changi City Point’s Instagram Page. Participants whose Instagram accounts are not open to public will be disqualified. FCM reserves the right to disqualify any entry submitted by a participant with a fictitious or phantom Instagram profile. One (1) entry by a participant consist of their most creative name for these creations shown in the images. Their entry must be submitted as a comment in the contest post. All other forms of entry will not be considered. 5. At the end of the contest period, all eligible entries will be compiled. Changi City Point will select three (3) winners from Instagram. The winner will be announced on 21 June 2017, via a winners’ announcement post on Instagram. 7. All winners will be determined by Management of FCM (whose decision shall be final) on 12 June 2017 after the closing of the entry period and notified on 21 June 2017 via a winners announcement on the Changi City Point’s Instagram Page. 8. All winners to this Contest must contact Changi City Point via Instagram Direct Message within 7 days of the announcement of the winners and provide their NRIC Number, Full Name as per NRIC, Mailing Address as per NRIC, Email Address, Contact Number and Date of Birth to be eligible for the prize. Multiple entries of winners from the same mailing address will not be allowed. In the event that there are multiple winners from the same mailing address, only the winner with the earlier entry will be taken into consideration. 14. Data of each participant will be collected, stored and processed for the purposes of administering and assessing this Contest. By joining this contest, participants consent to and grant Frasers Centrepoint Malls the right to use the contest submission (images / videos) for marketing, promotion and / or advertisement purposes, including print, audio-visual and social media, without restriction or limitation and for unlimited number of times.